Achtung! Warning: poster is better than the movie. 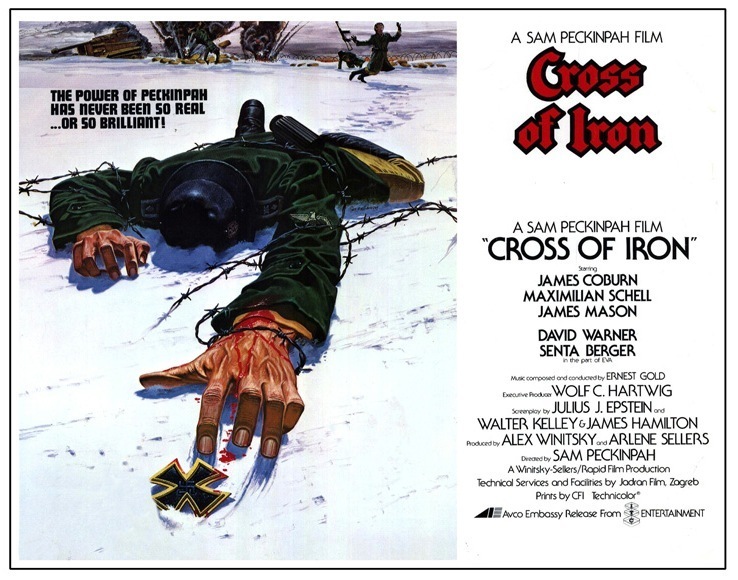 CROSS OF IRON : a WW2 movie directed by Sam Peckinpah. That distinction was enough to get fans of the legendary maverick salivating for his renowned action sequences, and hopeful he’d gotten his mojo back after three failures in a row. As it was, he let them down. Aside from some scattered visual moments here and there in the furious (but repetitive and choppy) battle footage, the direction, writing and editing stumble beyond the mayhem into the anemic, plodding and obvious, quickly becoming a 133-minute chore. Set in southern Russia, 1943, it takes on the German side of things as the battered Wehrmacht stubbornly yields under the Soviet onslaught. I spent the winter in Yugoslavia with Sam Peckinpah. 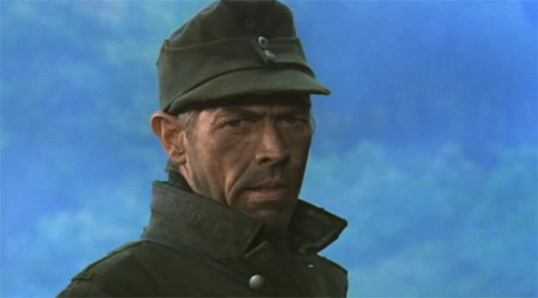 James Coburn gets the weariness down, but Peckinpah’s narrative incoherence (not helped by his being monumentally drunk throughout the production) and the scripts Panzer-heavy tread grinds the irony-futility angle into the mud. 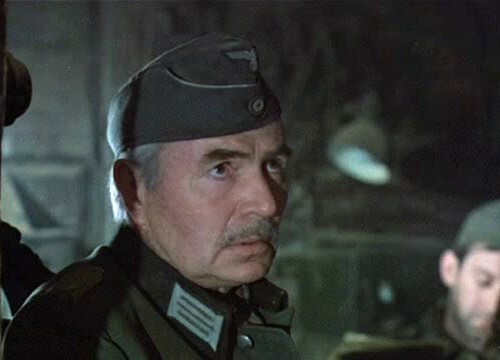 Maximilian Schell is fine but his character is poorly written; David Warner adds pessimism, while James Mason—great actor or not, and uber-vetted at playing German officers—is just too old at 67 to convince as a front-line officer. 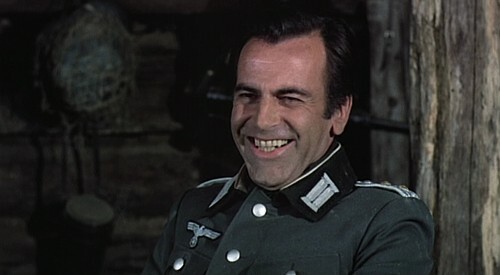 Senta Berger is wasted in a throwaway turn, possibly written in as a gesture by the director for her work in his Major Dundee a dozen years earlier. All I know is we had a few schnapps and ended up in Kiev. Lifetime Award for Best Englishman Playing a German. Even with these pros, the turgid writing doesn’t leave you invested or caring what happens to any of them. The production ran out of dough halfway through, after sinking six million bucks on location in Yugoslavia. The authentic props and vehicles (T-34s, for you tank aficionados) win nods from genre and history buffs, and the rich lensing comes from John Coquillon, who’d done great work for Peckinpah on Straw Dogs and Pat Garrett And Billy The Kid. A big success in Germany, in America it was generally demoted by critics when released in 1977; it’s now over-praised. They were right the first time. Audiences quickly deserted to the more enjoyable action of Star Wars. Like the joyless tale it tells, this was but a futile rearguard action in Peckinpah’s retreat from glory, and his next two defeats wrote finis to Sam’s combative, self-destructive saga. 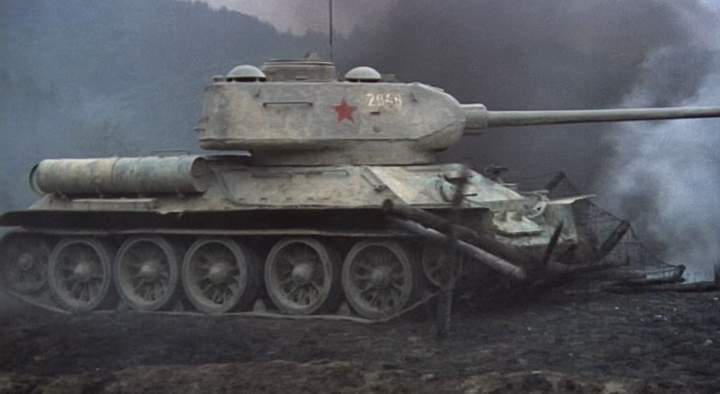 Actual T-34 thoughtfully left behind as gift by Soviet occupiers. Then it broke down.